Franklin-Monroe’s Chloe Peters (14) sends a shot back toward the Houston side of the during their Division IV sectional match on Saturday at Covington. 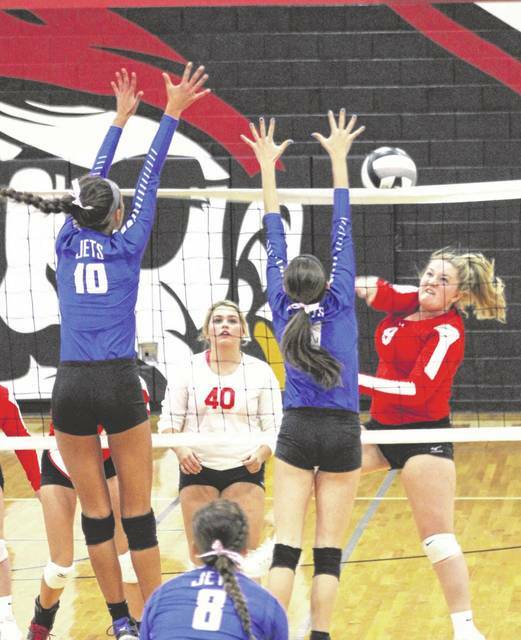 The Lady Jets swept the Wildcats in straight sets to advance to the sectional finals for the first time in eight years. Franklin-Monroe’s Brigette Filbrun (7) sets the ball up for a teammate during the Lady Jets Division IV sectional match with Houston on Saturday at Covington. FM swept the Wildcats in straight sets to advance to the sectional finals for the first time in eight years. Franklin-Monroe’s Chloe Peters (14) goes up for a block during the Lady Jets Division IV sectional match with Houston on Saturday at Covington. FM swept the Wildcats in straight sets to advance to the sectional finals for the first time in eight years. Franklin-Monroe’s Corina Conely (10) and Brigette Filbrun (7) jump up to block a shot from a Houston player during their Division IV sectional match on Saturday at Covington. FM swept the Wildcats in straight sets to advance to the sectional finals for the first time in eight years. Franklin-Monroe’s Corina Conley (10) smashes the ball back over the net during the Lady Jets Division IV sectional match with Houston on Saturday at Covington. FM swept the Wildcats in straight sets to advance to the sectional finals for the first time in eight years. Franklin-Monroe’s Kloe Zink (3) smashes the ball over two Houston players during their Division IV sectional match on Saturday at Covington. FM swept the Wildcats in straight sets to advance to the sectional finals for the first time in eight years. 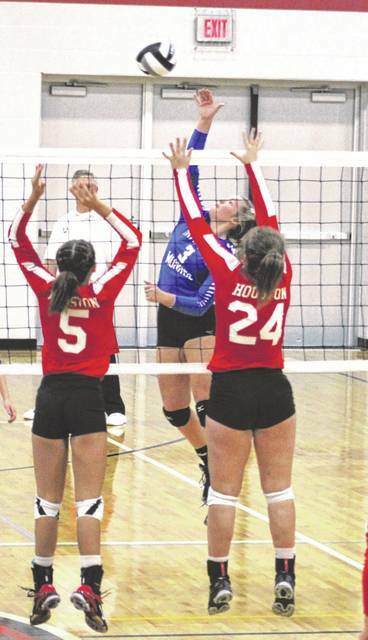 Franklin-Monroe’s Kloe Zink (3), Corina Conley (10) and Chloe Peters (14) prepare for the smash coming their direction from Houston’s Hayden Riesenbeck (24) during the Lady Jets Division IV sectional match with Houston on Saturday at Covington. FM swept the Wildcats in straight sets to advance to the sectional finals for the first time in eight years. 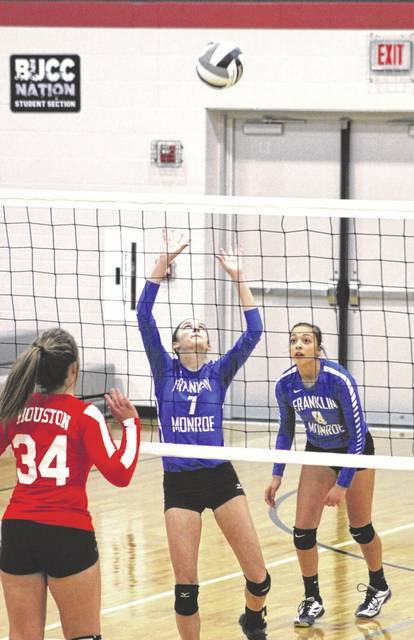 COVINGTON – The jitters are gone for the Franklin-Monroe volleyball team as they defeated Houston in straight sets on Saturday to advance to the Division IV sectional finals for the first time in eight years. 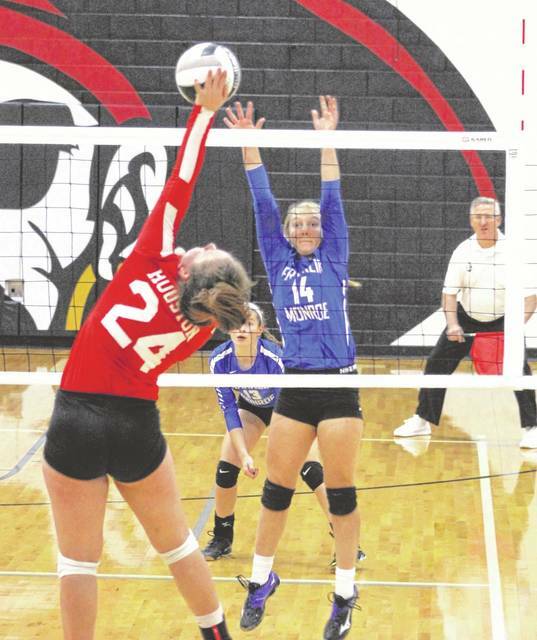 The Lady Jets came into the match very relaxed, according to Coach Angie Filbrun, after her squad shook off any possible nervousness with its first-round win over Cedarville last week. 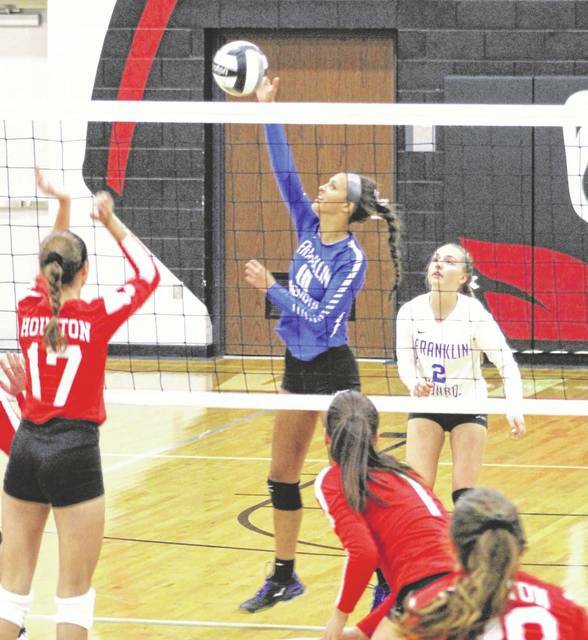 FM was focused, determined and played with enthusiasm in defeating the Wildcats 25-13, 25-10, 25-14 to get to 20 wins for the second straight season. 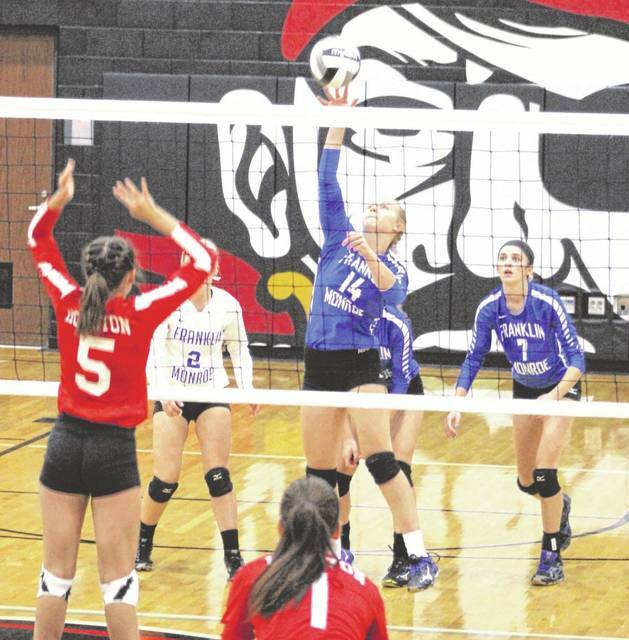 Franklin-Monroe (20-4) will meet Fort Loramie at 8:30 p.m. on Wednesday for the sectional title at Covington High School. Morris, one of tow seniors for the Lady Jets, recorded 12 assists and 15 digs in the win. 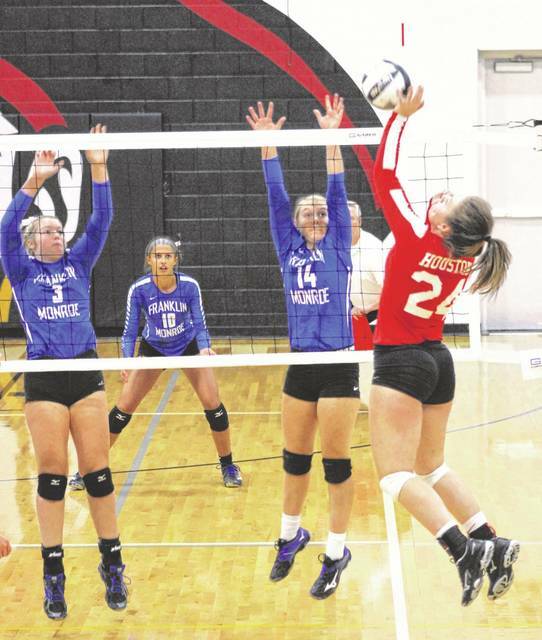 The teams other senior – Brigette Filbrun – contributed 13 assists, 16 digs and had 1 ace. That’s what Franklin-Monroe did from the start as they took a commanding 15-3 lead in the first set cruising to the 25-13 win. In the second set, it was more of the same for FMHS getting out to a 5-0 lead on a Chloe McGlinch kill. Houston never got closer than 8 points the rest of the way as the Lady Jets closed the second set on back-to-back kills by Belle Cable and Corina Conley. The third and final set didn’t look much different either, even though the Wildcats mounted a late charge to score their most points (14) of the entire match. Conley had several more kills in the third set and ended the match with a team-leading 10 kills. She also had 4 aces and 2 blocks. Other contributors were Kloe Zink (8 kills, 1 block), McGlinch (5 kills, 1 ace, 13 digs), Chloe Peters (4 kills, 11 digs) and Cable (13 digs, 1 ace, 1 kill). “I think because we got that first round win the other day we were able to relax more today,” Coach Filbrun said. “I felt like we came out today so relaxed and we played our game and did what we can do. We were confident tonight and they were just having fun, relaxing and playing the game. That’s what is fun.